A Good Windshield wiper fluid is an essential product for your vehicle today. With unsuspected weather conditions, your windshield has to stay clean for your safety and for the safety of everyone you share the road with. Today there many different types of windshield wiper fluids that are used for many different things such as cleaning bug debris away, clearing splashes off the windshield, snow, dirt, or anything else that can impair your vision. There are a lot of different washer fluids to choose from and it can be a confusing task, so we've taken out the guess work to really break it down for you, and we're going to highlight some of our favorite brands that you just can't go wrong with. How can you be sure that any of these solutions will do the job? Well, all of the following cleaners are top rated and top sellers. The 303 Instant windshield washer tablets are very easy to carry in your car in-case you run out of the fluid on the road. This product comes with multiple mixing tablets that can be used for GALLONS of cleaner! The 303 product is as easy as adding a gallon a water to each tablet for long lasting cleaner. This product is highly concentrated, so you can have a ton of it on hand without taking up your entire trunk.. It is good for cleaning all sorts of debris off your windshield like dirt, bugs, grime and other heavy weather conditions. It's a heavy-duty option, so if you do a lot of highway driving where you're constantly hitting bugs and needing all the cleaning power you can get, and you go through fluid pretty quickly, this will likely be your best bet. Nextzett has created a windshield washer fluid that comes in a 8.5 fluid ounce container that can create 7 gallons of cleaner! This windshield washer has a pleasant citrus scent that keeps that windshield looking clean and also smelling clean! This product is great for cleaning heavy debris and also leaving a streak-free surface on your windshield. This product also helps with windshield wiper skipping and shuttering as it has the formula to keep the windshield pure and water resistant. The Nextzett is rated 4.5/5 stars at major market places and is high in reviews around the web. 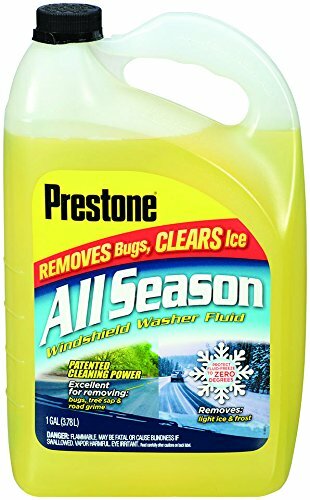 This Prestone windshield washer fluid comes in a 1 gallon container. 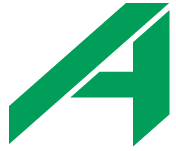 It specializes in heavy duty work such as tree sap or even bird droppings. The Prestone BugWash improves visibility, and can be used for regular weather but isn't meant for freezing weather conditions. The Camco windshield wash formula also comes in a 1 gallon container and does NOT need to mixed with any other liquids. This washer is great for those cold weather conditions as it will NOT freeze during any sort of degree change. It also can be used during the summer or warmer conditions as it is a ALL SEASON product. The Camco wash product is a healthy product to use for your windshield as it cleans and perfects your windshield from dirt and debris. The Camco is rated for -20 degrees and is extremely useful when those untold weather conditions could be on there way. 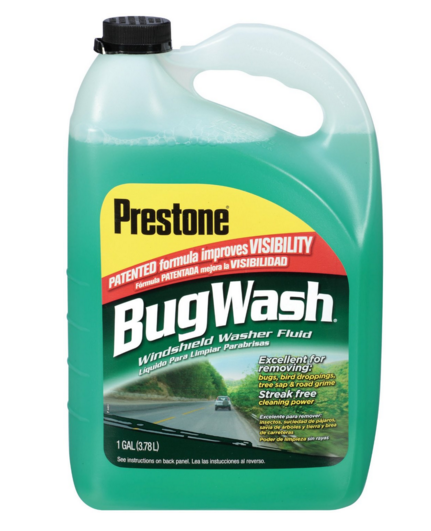 The Prestone All Season windshield washer fluid is a year round product that CAN be used in cold weather conditions. The Prestone washer is mainly used for any debris or light droppings from birds. This is a non-mix formula can be used at any time and is OK for any windshield wiper time. This product is rated high among other products mentioned because of its multi-purpose formula that keeps your windshield clean and clear. The Prestone washer is fragrance free and will not leave any residue left on your windshield after use. The Rain -X additive is a very effective product that can be added to an existing Rain-X winshield product for more strength over heavy weather. 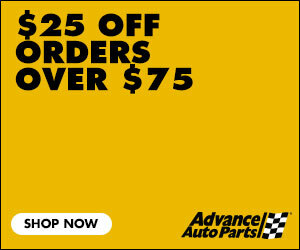 This products enhances driving capabilities and is great for all weather conditions. 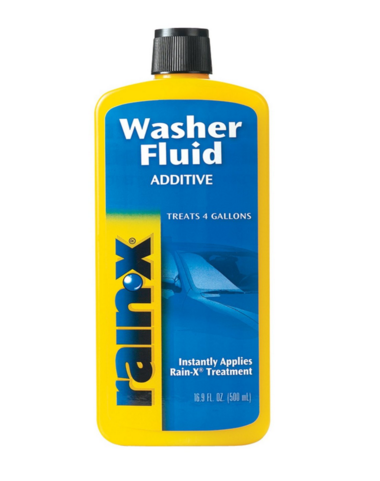 The Rain-X Washer Fluid additive is also used for cleaning dirty bugs or grime from your windshield. It is very useful to carry around in your vehicle if you are on the go. This product comes in a 16.9 fl. oz. bottle and is very easy to apply into your windshield washer canister. The Best Windshield Washer Fluid of 2017 is the 303 Instant windshield washer fluid. It is rated the highest out of any the products and produces the best outcome for clean windshield. This product is VERY effective and can be used at any time. With its water resistance formula, the 303 product will wipe away any water that gets in the way. If you are looking for a simple and fast windshield cleaner for your car, this is one for you.